A stunning 9ct white gold two band solitaire ring, with sparkling Cubic Zirconia. Every Pure Brilliance Zirconia is marked with a microscopic engraving that is completely invisible to the naked eye. This quality seal serves as your assurance that you are acquiring stones of the highest precision and brilliance, which meet cutting standards. 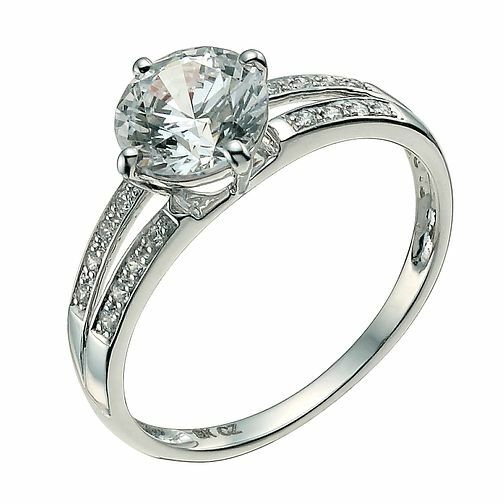 9ct white Gold and Cubic Zirconia Solitaire Ring is rated 4.5 out of 5 by 2. Rated 5 out of 5 by Anonymous from Beautiful and very sparkly I absolutely love it, it’s beautiful ring and looks very classy. It has a beautiful spark. Worth getting it. My boyfriend got it for my birthday and I absolutely adore it.